Welcome to our step-by-step guide for indoo.rs starters. Please follow our detailed instructions for each step to gain the best possible first experience with our service. Be aware that you may need an Internet connection during some of the following steps. Please read each section carefully. If you are using the online guide, simply click on an image and it will be enlarged. You can jump to each section directly, using the navigation given. Furthermore, you can jump back to the top of the page using the Jump To Top link on the right side of each section's header. 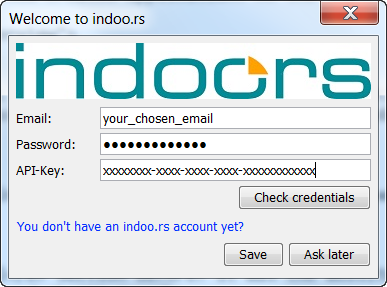 In order to use our service, you need to create an account on the following website: https://my.indoo.rs. If you click on the provided link, you will be taken to our website which looks like this. To sign up, simply press the Create an account link which is framed red in the image below. After having clicked on the Create an account link, you see a registration form as pictured in the image below. Now fill in your contact information in the fields given: e-mail address, password, first name, last name, company (optional). Now the registration process is completed and we can move on to the next section called Activation. If you completed the registration process above, you will receive an e-mail from us. The next image shows how the e-mail can look like. This e-mail contains an activation link. 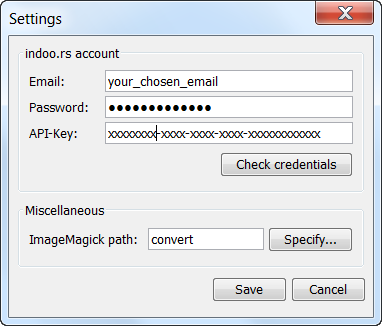 In order to activate your indoo.rs account, please click on the activation link given. Your browser opens a website now. If the activation process was successful you see a website that looks like the following image. 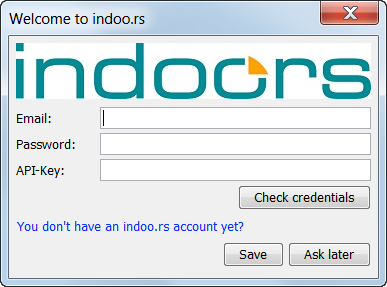 After having activated your indoo.rs account successfully, visit https://my.indoo.rs to log in. The website looks like the following image. To log in to our service, please fill in the e-mail address and the password you chose during the registration process. The image below highlights the two fields where you need to fill in your data. After having inserted your information in the e-mail-/password field, you can log in. To do so, click Login. If you are forwarded to a site that looks like the next image you've done a good job so far. You are looking at a website like the image above? Congratulations! Now you have mastered the first process successfully, registration and activation. To create your first application, please follow the upcoming instructions. First you need to log in on our website. In the login section of this guide you can find steps and images which will lead you to a successful login. Just click the Create your first app link to create your first application. Now you see an empty description field which looks like the image below. To create your first application, simply fill in your desired application name in the App Name field and click Create App!. Now you have the chance to order different iBeacons. If you don't want to buy iBeacons right now simply click the X or outside of the pop-up menu. You can buy iBeacons any time you want, just click on Beacons on the left side highlighted in the next image. Congratulations! You have completed the second step of this guide now. Now we will set up the Measurement Tool (abbr. MMT). The first step is to download MMT. You can download it from the Downloads & Documentation section on http://my.indoo.rs. Click on the download link for the Measurement Tool for your specific PC. (e.g. x86 or x64 for 64Bit Operating System) Download the Measurement Tool and install it on your PC. The install wizard will guide you through the whole installation process. MMT is supported on Windows Vista and above. The first time you start the Measurement Tool, you are asked to fill in your chosen e-mail address and password. Furthermore there is a API-Key field. You can find the API-Key on the overview page of your applications. 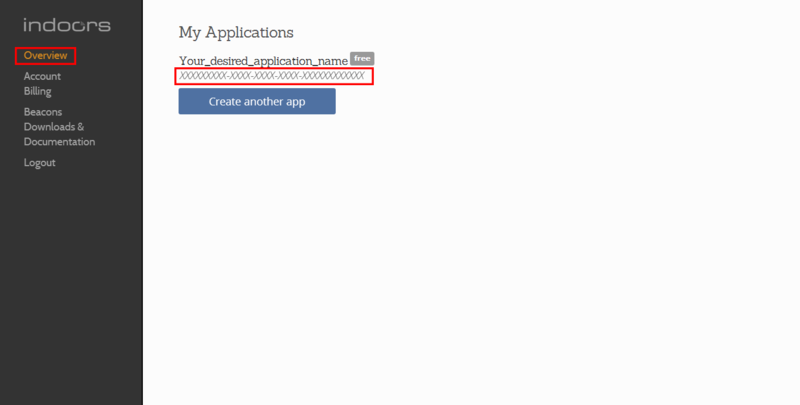 Just click on Overview on the left side and the API-Key of each application will be displayed below each applications name. Insert the given API-Key of the website into the API-Key field of the measurement tool. If you have filled in all the fields highlighted on the next image, you are good to go and ready to press the Check credentials button. If the data you filled in were right, a message that the check was successful is shown. Be aware that you need an Internet connection to check your credentials. First click OK, second click Save and you are ready to use the measurement tool. You can also edit your saved information by clicking on File->Settings. A window will pop up and you are able to edit, check and save your data. Now a new window pops up. The most important field right now is the Building Name field. It's the only mandatory field at the moment. You don't want to fill in the other optional fields? If so you can skip to the next section named Create Floors. If you want to fill in the optional, fields please keep reading the guide. The first optional area is the Description area. You can insert a description of your building right here. The second field is the Location/Rotation field. You can fill in your address here and then click on the search icon next to the field. After having clicked the search icon, the measurement tool will locate the filled in address and show a marker on a map automatically. The rotation is required to know how your building is located relating to longitude/latitude. Therefore click on the map where the top left corner of your building is. You need to do the same with the top right corner. The rotation of the building and Longitude/Latitude are automatically set. The following images show the process. The different colored circles show the location on the floor map and on the real map. Voilà! You nearly finished the process of creating your first building. What's left to do? We'll now move on to the next section and add some floors to your building. 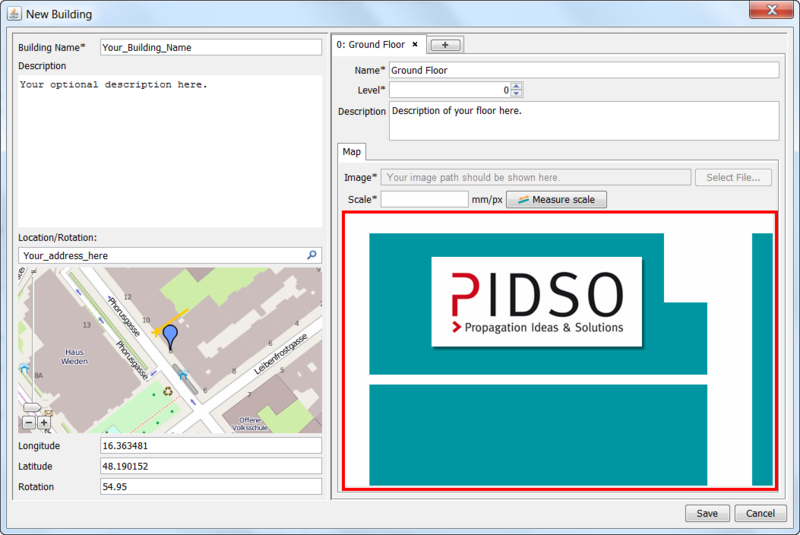 To create a new floor simply click on the + button which is framed red on the following image. Now there is a new tab available. There are several mandatory fields. So let's take a closer look at these fields. The first field to fill in is the Name field. (e.g. "First Floor", "Second Floor", "Basement Floor") The second field is the Level field. You get to choose the level of your floor. (e.g. "First/Ground Floor" = 0, "Second/First Floor" = 1, "First Basement Floor" = -1) You can also fill in a description of your floor but it's optional. What we need to finish the first floor, is a floor map. 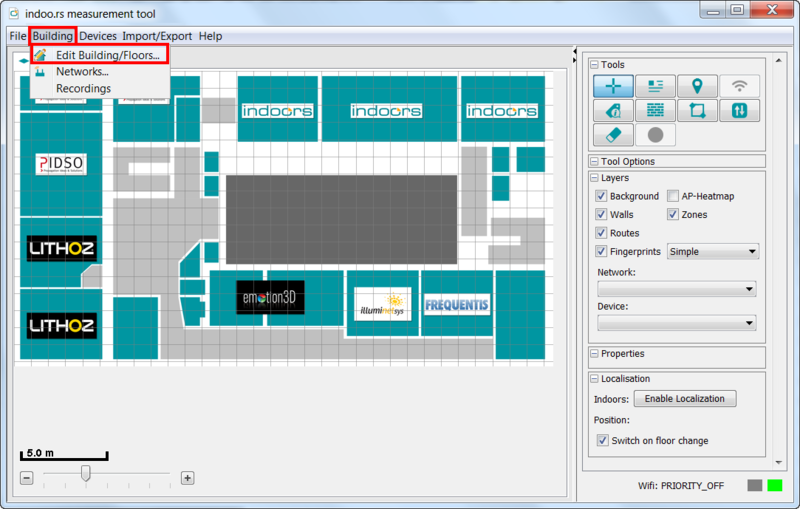 To add a floor map, simply press the Select File button and open it. If you want to delete a floor, simply press the x in the particular floor tab. You can do so any time you want and start over by creating a new floor again as mentioned before. At the moment the measurement tool only works with .png files only. We recommend a minimal resolution of 150dpi. 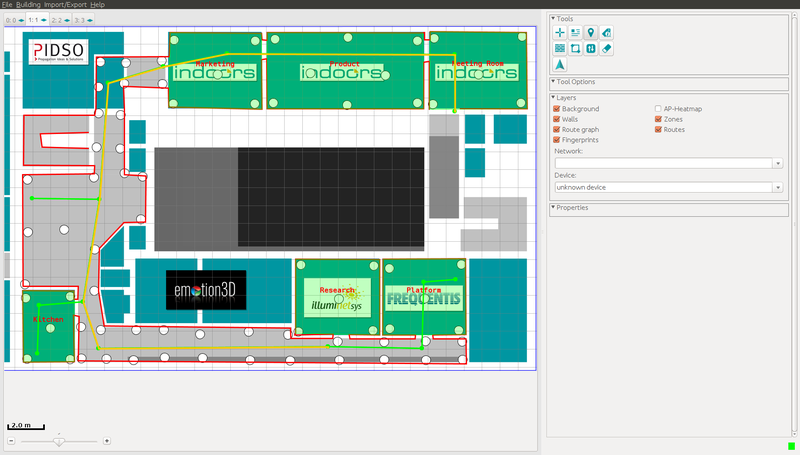 The floor plan should not be bigger than 20MB even though we support also bigger files. If you do not have a floor plan, try to look for an escape route plan in the building or just do a sketch of the building for demonstration purposes. After opening, the floor map is shown at the bottom left corner. Now there is only one small step to do. The measurement tool needs to know the proportion of the image and the real dimensions of the floor. Just click on the Measure scale button. Now look for two points on the floor map where you know the real distance. Then simply click on the map. 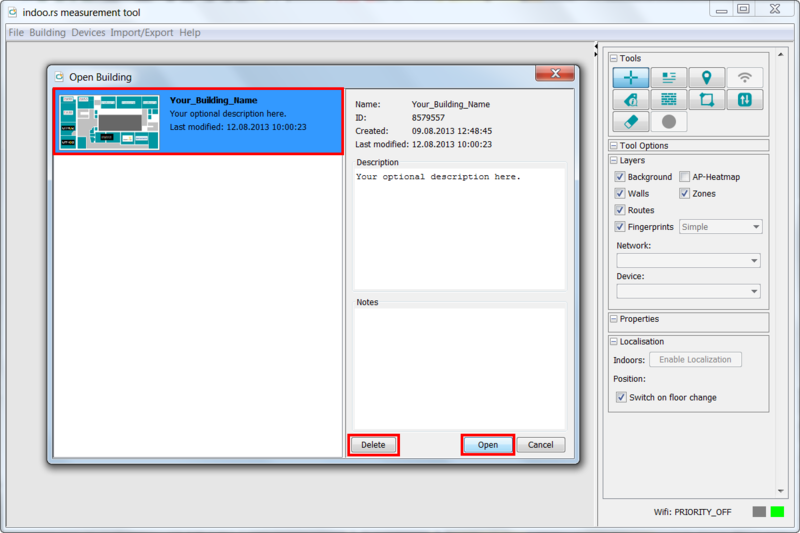 The tool draws a line between the two points you have clicked and open a new dialog. Just enter the real distance in mm (millimeters) and click OK.
You have finished your first floor! If you want to add more floors, simply repeat the points that we have just gone through. You added all floors you need? 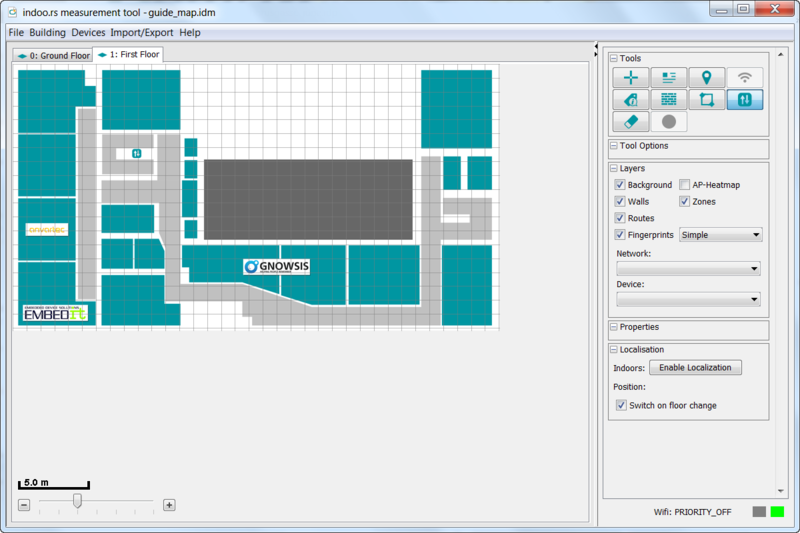 Well just click the Save button and the measurement tool will load all your floors. Now the tool looks like the following image. 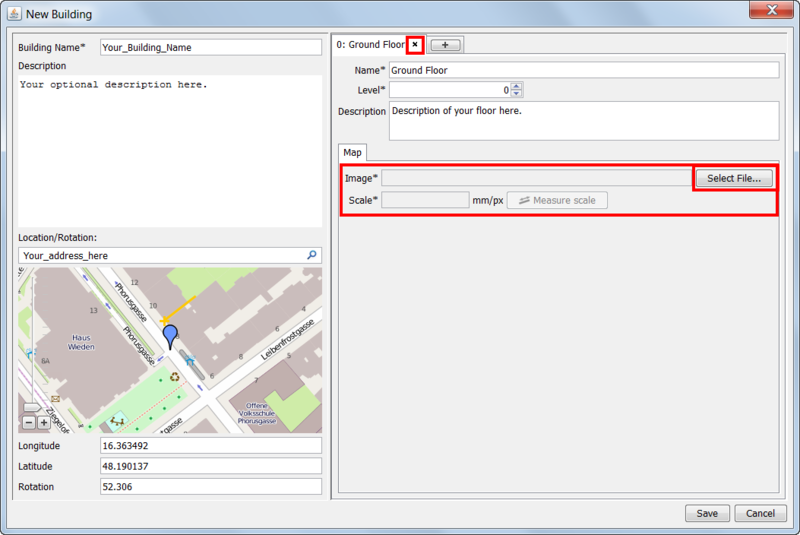 If you want to edit the floors or the information of your building, you can click on Building -> Edit Building/Floors. A new window will pop up where you can edit all your building information. Now we are going to save the progress you made so far. Please read the two different saving methods. We recommend to save minor changes to a local file first. The first method is to save the building to the cloud. Let me explain the step for this method. You either need do click File -> Save to cloud or click Ctrl + S on your keyboard simultaneously. After doing so, a new dialog will pop up. Here you can fill in an optional note and then simply click Save. Now your building will be uploaded to our servers. The second method is to save the building as a file on your PC. Just click Import/Export -> Export file or click Ctrl + E on your keyboard. A new window will pop up. You can choose a path where you want to store your building file and a file name. If you've chosen the path and a file name, click Save and your building is saved as a local file on your PC. Congratulations! You've created your first building successfully, including floors and you saved it either to our server or on your PC. If your building was saved, exit the measurement tool and start it again before continuing with the next step. In the last section you saved your building either as a local file to your PC or to our cloud. The way to load a building depends on the saving method you used before. We will take a look at both different ways. There's also a menu item called Quick Import in the Import/Export menu which will load your last opened building automatically. If you saved your file locally on your PC this is the right section for you. 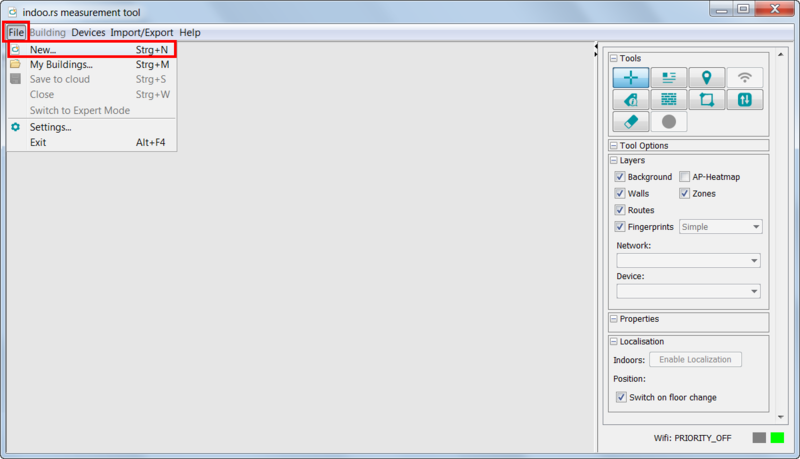 The Import/Export menu item contains a Import File item among other menu items. A click on the Import File menu item opens a new window and lets you browse for the building you saved as a local file before. Just browse for the specific file, select it, click open and you're good to go. If you saved your building to our cloud, please follow the upcoming instructions to load your building. Click either File -> My Buildings... or Ctrl + M simultaneously. A new window will pop up, which contains all your buildings you have saved to our cloud so far. Simply click on the building you want to load, followed by a click on Open. If you want to delete your building, just click on the Delete button instead. The window also shows detailed information of your buildings such as the building name, building ID, creation date and modification date. There is a variety of functions available in the measurement tool. We want to take a closer look at a bunch of different functions now. 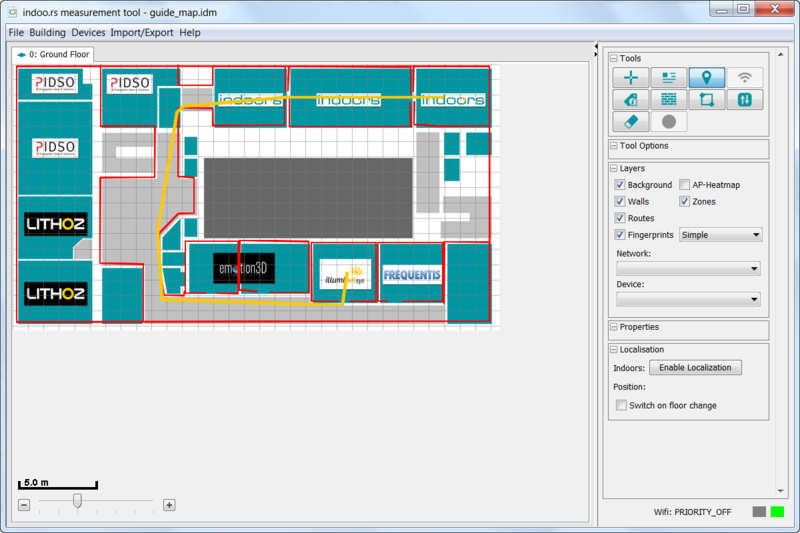 The following image shows the Tools section of the MMT. Below that image there is a short description of each tool. If you want to read a more detailed information of a tool, just click on a specific button on the Tool section image. 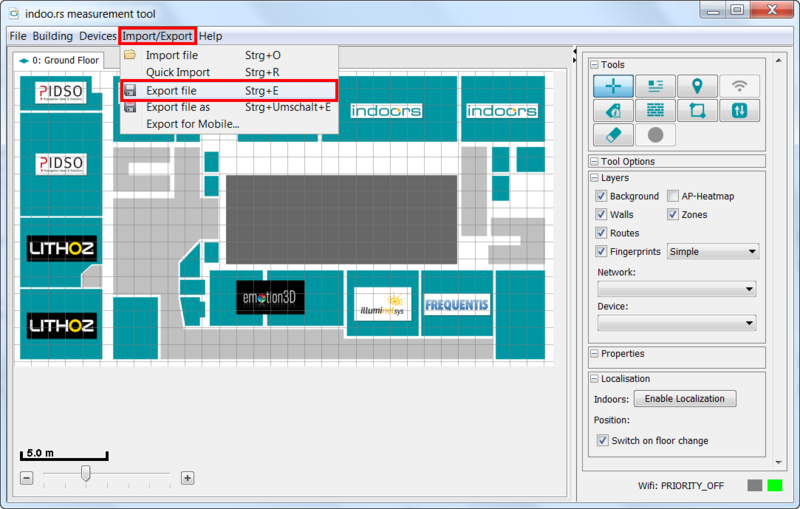 Set Marker: The Marker tool is the default tool with no functionality. 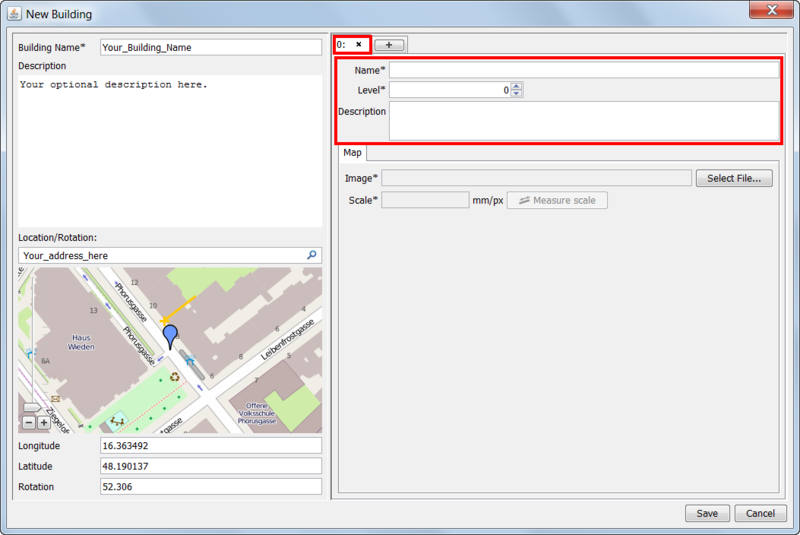 Properties: The Properties tool is used to show and edit properties of several objects, e.g. portals or zones. Route Tool: With the Route tool a route between to points can be calculated and displayed in the MMT. 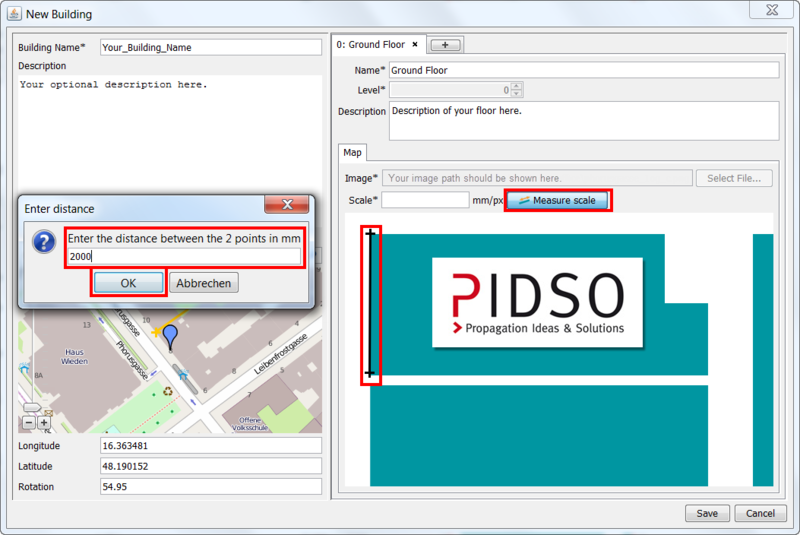 Evaluation Tool: With the Evaluation tool it is possible to simulate points in a building and save it as JSON. 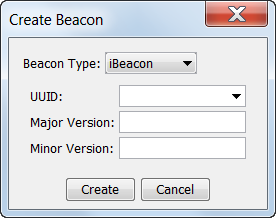 Create Beacon: With the Create Beacon tool you can create new or move existing beacons in the MMT. Wall Drawer: The Wall Drawer tool is used to draw walls. Portal Drawer: The Portal Drawer tool is used to create portals, representing e.g. stairs, elevators or escalators. Eraser: With the Eraser tool you can delete different objects in the MMT, e.g. walls, portals, etc. Predefined Routes Drawer: With the Predefined Routes Drawer: tool you can click on the floor map to draw predefined routes. Below is an image which shows what we will focus on now. 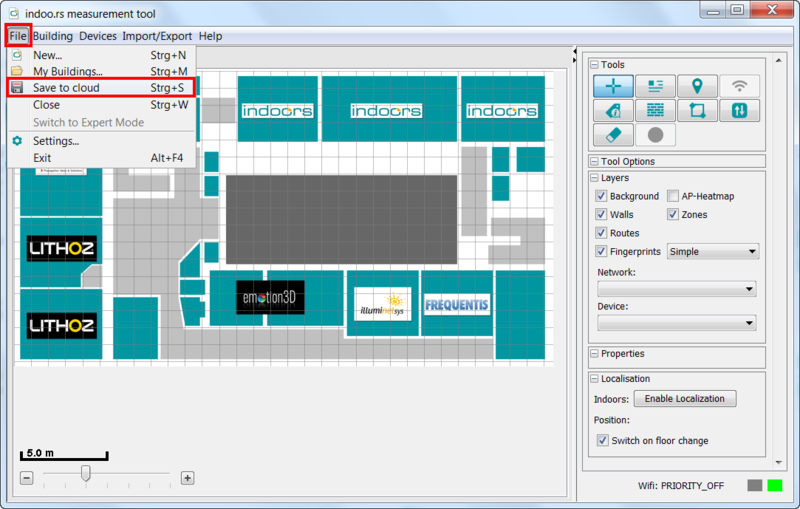 At the bottom left of the measurement tool there is a possibility to zoom in and out of the currently displayed floor map. You can either click on the +/- buttons or move the slider to the left or the right to zoom in or out. Above the slider there is also a scale visible. If you move your mouse cursor over the currently displayed map, you're able to zoom in and out by scrolling. You've zoomed in too much because you wanted to see every detail of your map, but it's cut off now? Simply move your mouse cursor over the map, click and hold any mouse button you want and move your mouse around. That's the way you move the floor map around. If you look at the right side of the measurement tool, you will see a section named Layers. What does it mean if a check box is un-/checked? Well, if a check box is checked, it means that the specific layer is shown on the map. E.g. if you uncheck the Background check box, the floor map background will disappear. Just check and uncheck a box and look at the map to see what has changed. The first tool we want to discuss, is the Eraser tool. From time to time everybody will use this tool. To use the eraser, simply click the Eraser button . If the Eraser button was clicked, the Tool Options will change. Now you have the possibility to choose what the eraser is capable to delete (Zones, Fingerprints, Portals). E.g. just uncheck the Walls check box if you don't want to delete them accidentally. If you move your mouse over the map after activating the eraser, a red square is displayed. With the slider on the right, called Width, you can define the size of the eraser. Now we want to take a closer look at the Properties tool. This tool is used to show and mostly edit the properties of different objects (e.g. walls, zones, beacons) in the MMT. Let's show the properties of a beacon. Simply click on the following button to activate the Properties tool. If you want to show the properties of a beacon, make sure the Networks check box is checked. Now you only need to move your mouse cursor over the specific beacon and press the left mouse button. As you can see the Properties section on the right side of MMT has changed. You can see the name of the beacon and other properties. Depending on which object (e.g. wall, zone, beacon) you click, the Properties section may look different. First click the Wall Drawer button to activate the Wall Drawer . After having clicked the button, the Tool Options will change and will look like the next picture. Now you have a slider, which you can use to define a range, in which a wall will snap to another wall. You can also disable the snapping, by unchecking the Snap to walls check box. With the Wall Drawer activated you can click on the floor map to draw walls. The left mouse button will add a point to the map and will connect this point with the point before and after. You can stop drawing the current wall by pressing the right mouse button. Walls will be displayed as red lines on the map. After having created your walls, you can test the routing. That means you can see if the routes that will be calculated are right. (e.g. no route through real walls and so on) To test the routing simply click on the Route button . Then choose two points of your map. Afterwards the route is calculated and a yellow line is drawn on the map. If the route is right, you've done a good job. Otherwise you have to correct your walls by removing and adding specific walls. There is also a possibility to route between different floor levels. Therefore, you need to create Portals, which will be explained in the Portal Drawer section. Remember that only walls do affect the routing algorithm. If you have had portals added before version 3.10.0 and want to use predefined routes through portals, please delete them and re-add portals. After you have added portals, you can draw a Predefined route to the new portal. 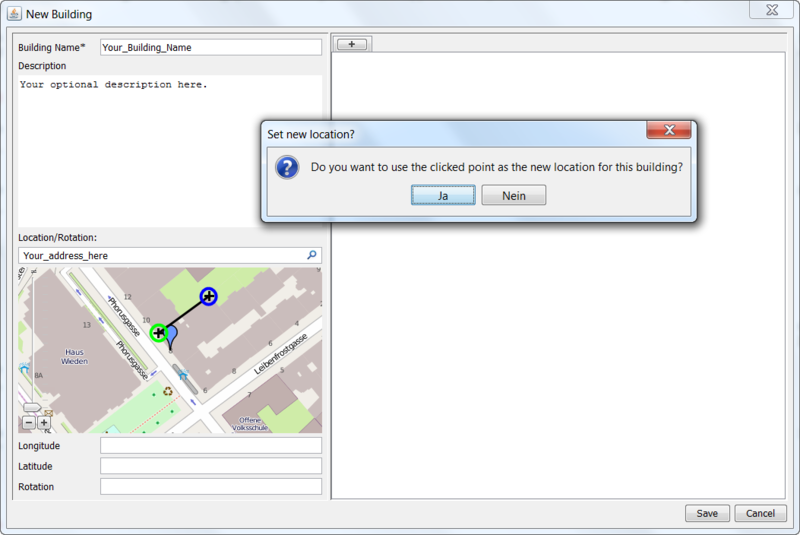 With the Evaluation Tool it is possible to simulate points in a building and save it as a json-file. To start the Evaluation Tool simply click on the Button Evaluation Tool . To record points you have to draw on the floor map. The left mouse button will add a point to the map and will connect this point with the point before. The points and lines will be displayed in pink on the map. The time when the point is added is considered during the simulation. The first point will have time 0. Note, that it is not allowed to switch between the floors during recording points. With the right mouse button you can delete all points from the map (like the Cancel Button). In this mode the Tool Options will change and will look like the next picture. With the Save Button you have the possibility to save the simulated points as a json-file. Therefore a new window will pop up. You can choose a path where you want to store the json-file. 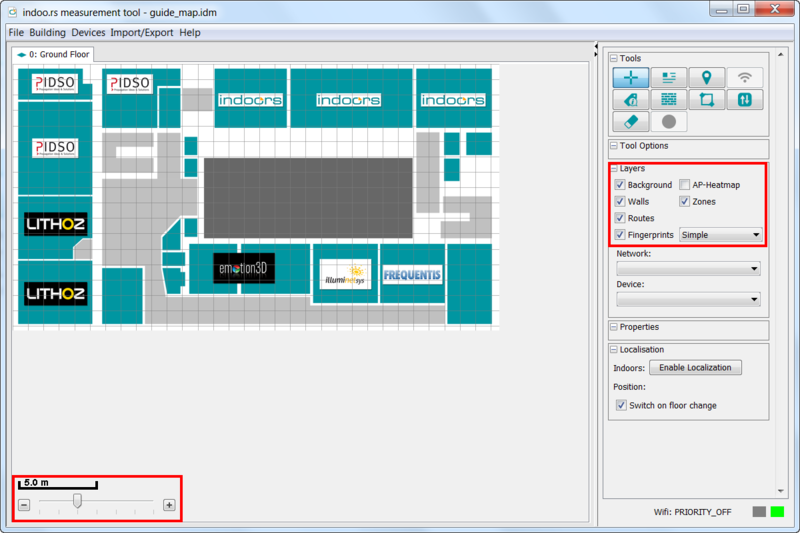 The filename has to have a certain format: simulation_<BUILDING_ID>.json, so it is already entered by default. Afterwards click Save and the simulated points are saved as a local file on your PC. With the Cancel Button you can delete already entered points. For more information how to use this file see the SDK documentation. To draw predefined routes you first need to select a routing mode that supports predefined routes. 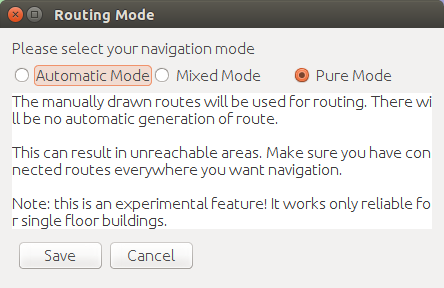 Go to the Building menu and select the Routing Mode option. A dialog will pop up as shown in the image below, where you can select which mode you want to use. After having created your predefined routes, you can test the routing. That means you can see if the routes that will be calculated are right. (e.g. 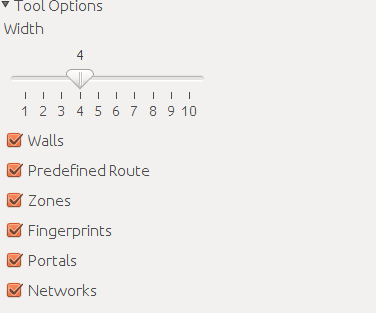 no route through real walls and so on) To test the routing simply click on the Route button Route Button. Then choose two points of your map. Afterwards the route is calculated and a yellow line is drawn on the map. To activate the Zone Drawer, simply press the Zone Drawer button . As you can see the Tool Option are changing. The Range slider has the same functionality as the Range slider of the Wall Drawer which was explained earlier. There are three different zone types provided. You can either choose POI (Point Of Interest), Deadzone or Inbound. We will now take a closer look at every single zone type. Let us discuss the POIs first. A point of interest is a specific zone that someone may find useful or interesting. POIs are meant to be shops, restaurants, offices, bathrooms and so on. The second zone type is the Deadzone. Deadzones are zones that are inaccessible e.g. open obstructions. Be aware that routes can go through deadzones. An Inbound is an inverted deadzone. (e.g. used to draw the outmost wall of a floor) Be aware that routes can go through inbound zones. Now you can draw zones like walls. 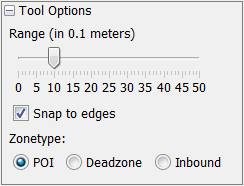 There is only one difference, the start- and endpoint of a zone need to match so that the zone polygon can be closed. Therefore, it's recommended to use the snapping as it's easier that start-/endpoint match the same position. POI only: If the zone is drawn correctly, a pop-up menu will appear and asks you to fill in a zone title. Enter your desired zone title and click OK. If done correctly, the zone is visible on the map. The zone will be a green polygon if it's a POI, a deadzone is blue and an inbound zone is blue outside the drawn polygon. All three zone types are shown on the next image. These zones can later be used in your client apps in various ways. 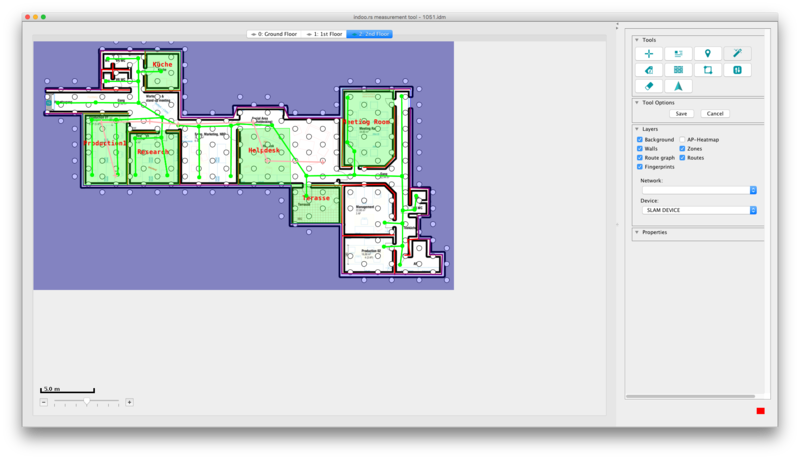 As mentioned before, our software supports multi-floor routing, which means that you can route between different levels. Portals are representing escalators, elevators and stairs. To do so, you need to create so-called Portals. Simply click on the Portal button . To finally create a portal, just click with the left mouse button on the specific position on the map and you will be asked, if you want to create a portal. Click Create Portal to create a new portal. If you have clicked on Create Portal, the portal sign is visible on the chosen position. In the following close-up image the portal sign is framed blue. 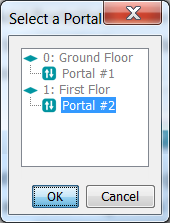 Right now the measurement tool doesn't know which floors can be accessed through a specific portal. To demonstrate the procedure, I will add a First Floor and add a portal to it. The following image shows the First Floor with the added portal. To switch back to the ground floor, simply press on the 0: Ground Floor tab. Notice that the name of your floor tab can differ. 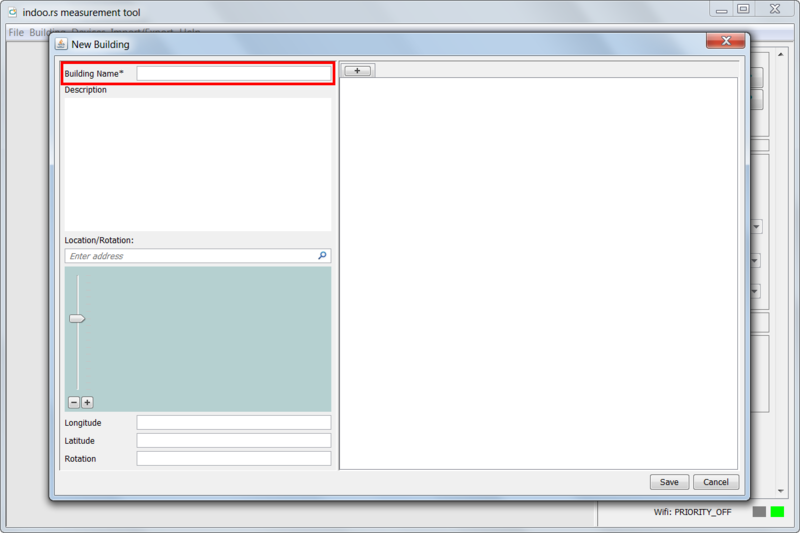 Now we will use the Properties tool to create a link called Portal Link, at least between two different portals. Simply click on the Properties button . As you can see, the Tool Options have changed. E.g. you choose from which objects you want to be able to show the properties. 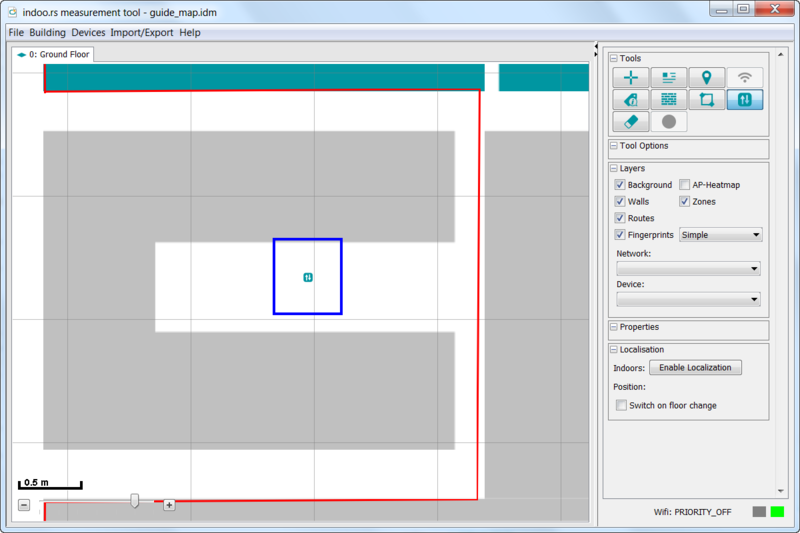 If you move your mouse over the image, a blue quadrat appears as your cursor. At the right side you can specify the width of the quadrat. Now move over the first portal to which you want to add a Portal Link and click the left mouse button. At the bottom right you can see that there is something displayed in the Properties section. Now click on the + sign Portal #1 to expand this node and then click with the right mouse button on the Portal #1 itself. It looks like the next image. To create a Portal Link, simply click on Add Portallink. A new window pops up, where all created portals are shown, grouped by each floor. Click on the specific portal which you want to link to the first portal. Afterwards click OK. Now the two portals are linked together. That means you can reach the first floor through portal #1 and the ground floor through portal #2. If you want that only the first floor can be reached through portal #1, e.g. contrary to an elevator an escalator only moves in one direction, you can switch to the First Floor and click on the portal #2 with activated Properties Tool. Expand the portal node in the Properties Section. Now do a right click on the to Portal #1 and click on Delete Portallink. The to Portal #1 label disappears. If so, only the first floor is reachable through portal #1 and not the other way round. Therefore, you can't go back to the ground floor, but that's only an example. There are two different modes available in MMT: Normal Mode (Proximity Mode) and Expert Mode (Fingerprinting Mode). We will discuss these two different modes now. Each mode uses a different method for localisation. Use normal mode only if you are on a tight time schedule for testing a development version of your app. If you are developing a proper app, we urge you to use the Expert Mode. The first image below gives an overview on the different modes available and their supported radios. The second image shows if WiFi™/Bluetooth® can be used for localisation on Android™/iOS devices. The Normal Mode (aka Proximity Mode) is the fastest way to enable indoor localisation in your building. If you are developing a proper app, we advise you to use the Expert Mode. If the normal mode is used, you will only get room-level accuracy. That means that your position will be displayed only where the nearest beacon is placed. In case you require higher accuracy, the Expert Mode is the way to go. The normal mode supports both iOS and Android™ devices. The whole process is explained in the MMT - Normal Mode (default) section. We recommend to use this mode combined with Zones. The Expert Mode enables additional functionality. If you choose to use the Expert Mode for building your map, you can create so-called Fingerprints to be able to use a potentially more accurate localization. We strongly recommend against a mix of manually placed iBeacon Locations and adding Fingerprints in the same map. You can either use WiFi™ signals or iBeacons for localisation. If you just use WiFi™ signals, only Android™ devices will be supported. iBeacons on the other hand enable localisation on iOS and Android™ devices. The whole process is explained in the MMT - Expert Mode section. Using localization in the normal mode will cause the reported location to be fixed to one of the manually placed beacons only. If you want fine grained location updates you will need to use the Expert Mode. Use normal mode only if you are on a tight time schedule for testing a development version of your app. If you are developing a proper app, we urge you to use the Expert Mode. Place 1 beacon per room if the room is smaller than 25m². 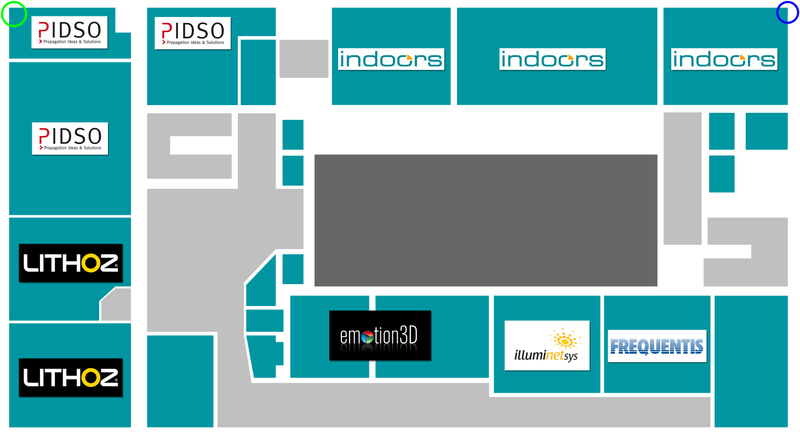 If the room is bigger than 25m² you can place more beacons. Beacons should neither be placed too far nor too near to each other. You can place the beacon in the middle of the room or on the wall if there is no other possibility. The following image shows a good positioning of beacons. In the big room 2 beacons placed to cover the area which is good. The following image shows a bad positioning of beacons. Why is the positioning of the beacons bad? First of all the big room has only 1 beacon. Furthermore the 2 beacons on the right side are too close to each other, even if there is a wall between them. Last but not least, the distance between the left and the middle beacon is too big. You need to create and place the beacons on your map in the MMT. To do so, simply click on the following button . As you can see, the Tool Options have changed. You can either click on Create network to create a new beacon on your map or click on Move network, if you want to change the position of an existing beacon. If you want to create a new beacon, select Create network as mentioned before. 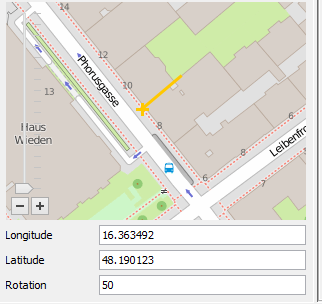 Now you only need to click on a specific position on your map, where the real iBeacon has been placed. After having clicked on the map, a new dialog will pop up. You should choose iBeacon as your beacon type, BLE Beacon has been depricated. Just fill out the given fields and click on Create. If you want to use the Expert Mode you need to convert your map. 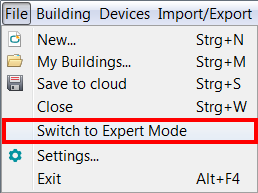 You can do this by clicking on File -> Switch to Expert Mode in the MMT. Now a new dialog will pop up and you are asked if you really want to convert your map. Click on Convert and your map will be converted instantly. Once you have converted your map and saved afterwards, you are not able to switch back to Normal Mode for this map. If you want to use iBeacons please read all the following sections. If you want to use WiFi™ signals only continue at the Measuring section. Note: Be aware, that you need an Android™ device running Android™ 4.3 or newer, which will be later used to measure fingerprints. First of all you need to place the beacons in your building. The images below give you an impression how beacons should be placed in your building. Furthermore all beacons should be placed at about the same height. 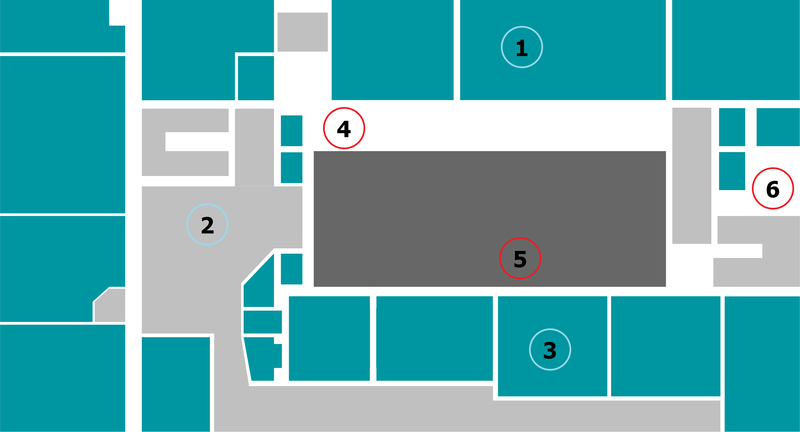 The range of an iBeacon is between 20 and 40 meters. Please keep in mind that the areas should overlap. 2 iBeacons will cover an area of 25m². The following image shows a good positioning of beacons. the beacons are evenly distributed. every spot on the map is covered by at least 2 beacons. there are 2 beacons per room. 2 rooms have 3 beacons but the room on the right side and the hallway have none. the beacons are all placed on the same side. the beacons are too close to each other and are not evenly distributed. For the measuring process you use the indoo.rs mobile toolkit. For a detailed guide how to use the indoo.rs mobile toolkit visit the documentation here. 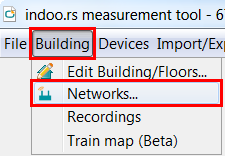 If you want to view/remove networks that have been measured, you can do this in the Building -> Networks... menu. 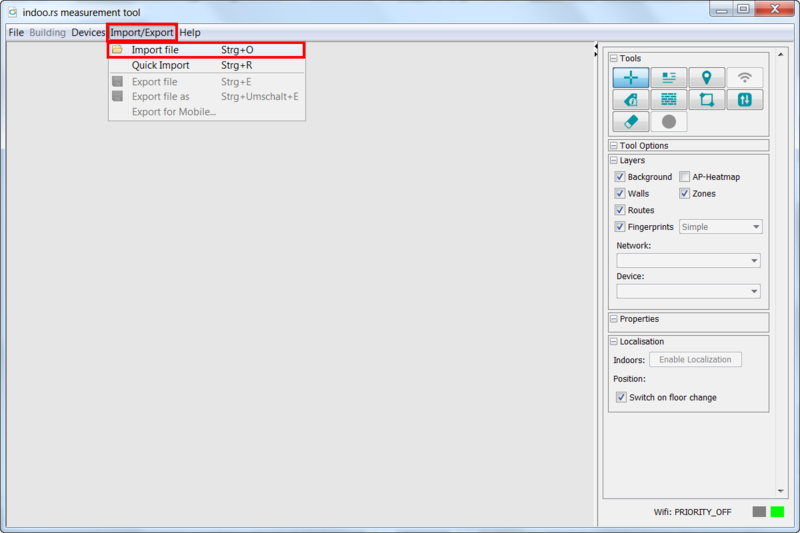 The dialog lists all measured networks. 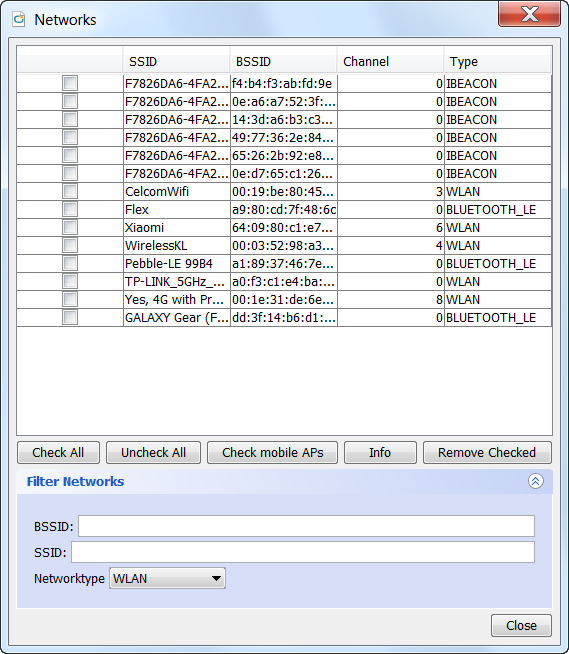 You can sort the networks by SSID, BSSID, Channel or Type. Furthermore you can filter the networks by networktype. All unneccessary and unknown networks should be deleted. That means that WiFi™ networks should be deleted if iBeacons are used for localisation, and vice versa. Also delete any network that you have not setup yourself, since you don't know if the location of that network might change. You can enable a feature called "GPS Fallback" to use GPS in case beacons are not available outside, typically parking lots. In order to do that you have to set the parameters in the Measurement Tool. 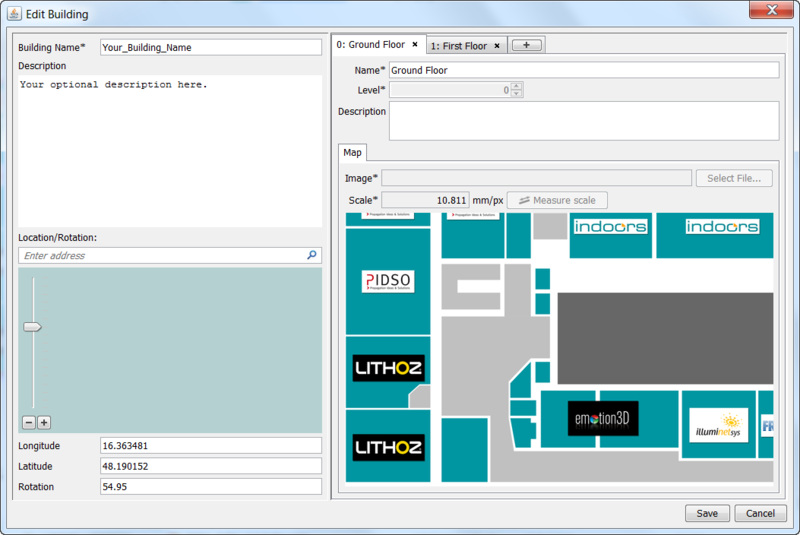 The required parameters depend on the location and you can use the indoo.rs Viewer to determine them. This means if you see less then X beacons and the accuracy of your GPS signal is better than Y the GPS position will be used on the specified floor. In order to do that we have a debug option in the indoo.rs viewer which lets you view the current number of beacons seen and the accuracy of your GPS signal. 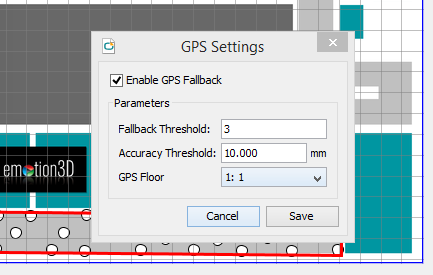 The GPS fallback needs to be enabled in the MMT before you can see those values (use the default parameters for now). Now you select a value for the beacon threshold and the GPS accuracy threshold so you get indoo.rs localization inside and GPS localization outside. If we choose the default values of 3 beacons and 10000mm accuracy for our example we would have the following problem: at Point 6 it would not use GPS localization because the GPS signal is above the threshold. Therefore we should increase the GPS accuracy threshold to 15000mm. This is still low enough so Point 3 would use indoo.rs localization. Important: The Buildings GPS origin and rotation need to be set. 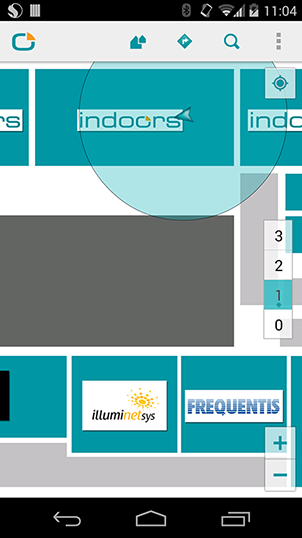 Beacons that support the iBeacon protocol advertise standardised packets and are supported by our software. Other (propietary) BLE beacons might not be supported. 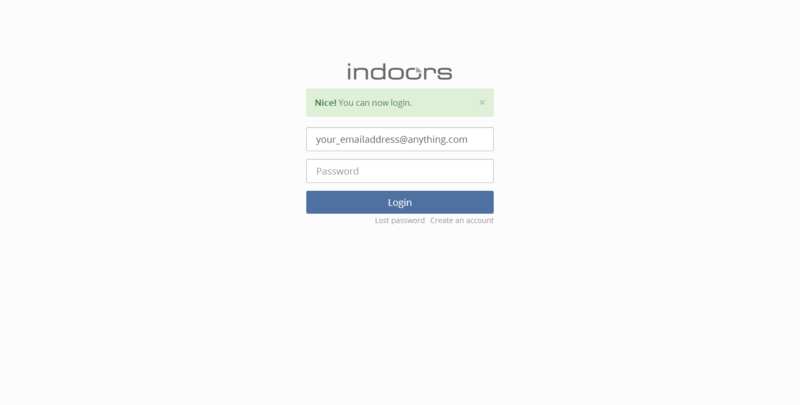 iBeacons can be ordered at http://my.indoo.rs/#/beacons. Note: Multiple iBeacons at a venue should share the same UUID. The major and minor value can be any value as long as any two beacons do not have the same major/minor combination. To get started with BEACONinside, please take a look at the following website: Get started. There is plenty of information available including an Android™ app. The Knowledgebase of Blue Sense Networks gives an introduction how to use their beacons. Glimworm provides a description and a configuration app for iOS. You mapped all your beacons or created all fingerprints in the MMT and saved your building to our cloud? Yes? Good! That means you are ready to test the localization with your iOS or Android™ device. Our indoo.rs iOS viewer app can be found here: iTunes – indoo.rs viewer. Just install it on an iOS device of your choice (iPhone 4s and newer). The next image shows how the app looks like and how a position is displayed on the map. Our indoo.rs Android™ viewer app can be found here: Play Store – indoo.rs viewer. Just install it on an Android™ device of your choice that supports Bluetooth LE (e.g. new Nexus devices). The next image shows how the app looks like and how a position is displayed on the map. In order to see how good the signal strength of a specific WiFi™ network is, you can enable the AP-Heatmap layer on the right side of the MMT. 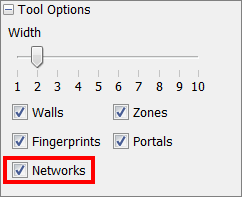 After having checked the AP-Heatmap layer check box, choose a network from the Network drop-down. 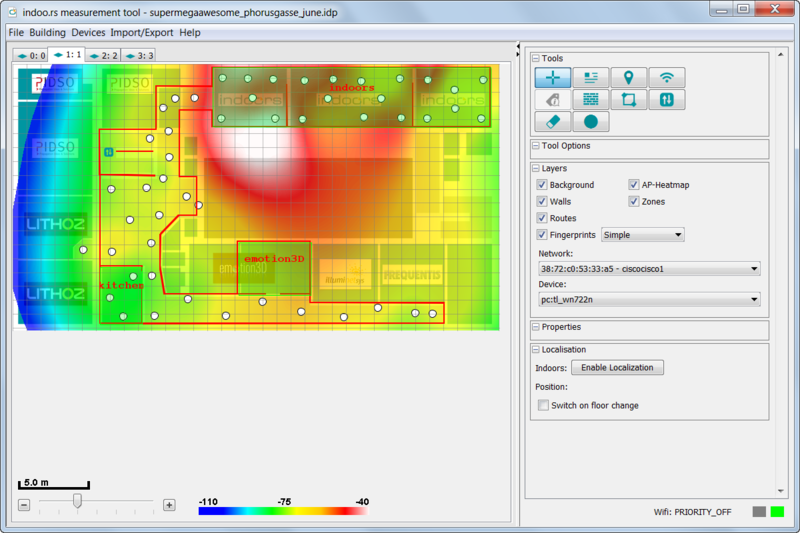 Afterwards the heat map will be calculated and displayed on the map. On maps with irregular point density it is possible that the heat map produces suboptimal results. As mentioned in the Measurement Process section, we recommend to spread the measure points evenly. On the image above you can see a white space in the top center of the heat map. 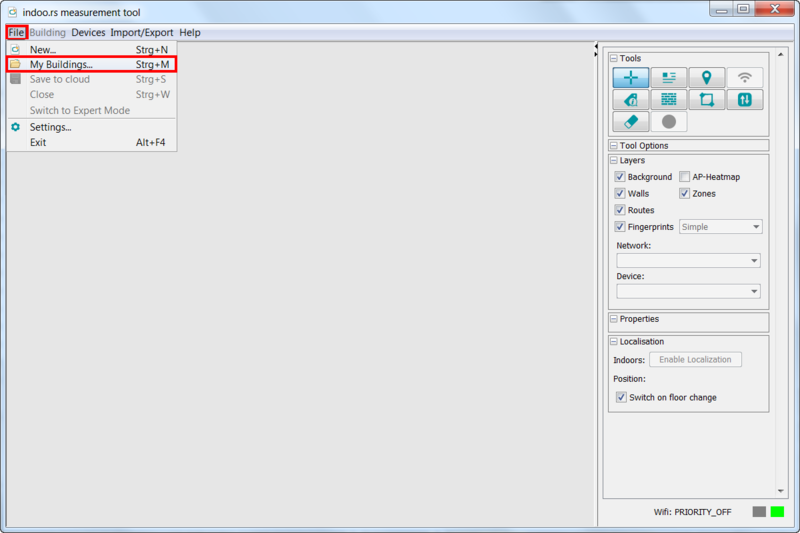 That means, that the selected network is not visible in that area. You encountered troubles while creating your building? Please read through the Troubleshooting section. Turn your device towards the iBeacon you would expect to destine your position (your body can block the signal to it). Try to get nearer to the iBeacon with your device. Also try to place your iBeacons at device height or higher (but not higher than 3 meters), and try to place all of them at about the same height. Check if the iBeacon in MMT at this position has the correct Major, Minor and UUID by using the Properties Tool: Properties. Check if your device has downloaded your latest version of the map from the server: Kill the indoo.rs viewer app on your device, start it again and load the map (forcing it to be reloaded from the server if there is a new version). Check if your map has been uploaded to our server. To do so, follow the instructions in Saved to Cloud. If your building appears in the dialog, your building has been saved on our server. If you are not sure about it being the latest version, upload it again and reload it on the device (see above). Use an iBeacon detector app for Android or Locate Beacon (iOS) to check if the iBeacon is alive and is really sending with the expected Major, Minor and UUID.